Great Ocean Walk hikers refreshed and ready! 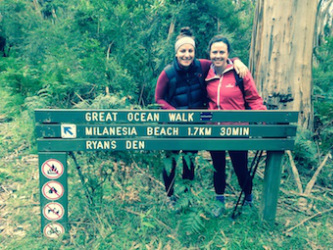 The Great Ocean Walk is fast becoming a major tourist attraction to the Great Ocean Road. Visitors are coming daily from all around the world to see the spectacular scenery that is common to the walk and the amazing flora and fauna you encounter. At Southern Anchorage we are right in the middle of the last few legs of the journey and some of the most spectacular and amazing walks. This makes us a must stop venue- in fact you could plan your trip based from Southern Anchorage. Check out our linked page for more information. The Gourmet Trail is a Chocolate Lover's Delight! The 12 Apostles Gourmet Trail is a great day's adventure close to our accommodation and the 12 Apostles. We have information (with a map) in our office and the delightful food and drink trail is a nice way to spend a day with the family or friends. Gourmet cheese, ice-cream, chocolate, wine, crayfish, single malt whisky- YUMMMMMM! Take into account that the trail takes approximately 4 hours and some of the attractions are seasonal. ​My favourite are the cheeses at Apostles Whey, they are sensational- great variety and award winning! For more information follow the link at the top. Photo courtesy of the Visit Victoria website! 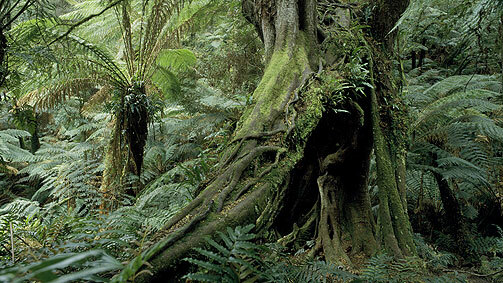 Melba Gully is a short 15 min drive from Southern Anchorage Retreat. It is on the left side just a couple of kms out of Lavers Hill, as you head west. I'd recommend visiting the area just before dark so you can walk the rainforest track and enjoy the amazing scenery and wildlife in the light. There are toilets and a bbq available so take supplies and have a bbq while you wait for it to turn dark (or grab a meal at Lavers Hill). After it becomes dark the same walking track takes you to see the amazing tiny world of the glow worms. All you need is a torch to help guide you and then the magical glow worm world comes to life as you turn off the light and let their world shine. Definitely worth a visit! There are so many great local spots to drop a line. Saltwater - Can't go past Gibson's Steps as the photo above shows- even just for the view! It's about 20 minutes away. Another popular spot is Johanna Beach. Both spots are terrific for salmon, snapper and gummies. There are also many fabulous spots around Princetown. Freshwater - The Aire River is worth a visit, just for the scenery, and just 10 minutes from us is the Gellibrand River. It hits the coast at Princetown and has many great spots along its stretch. Lots of fishoes target this area. 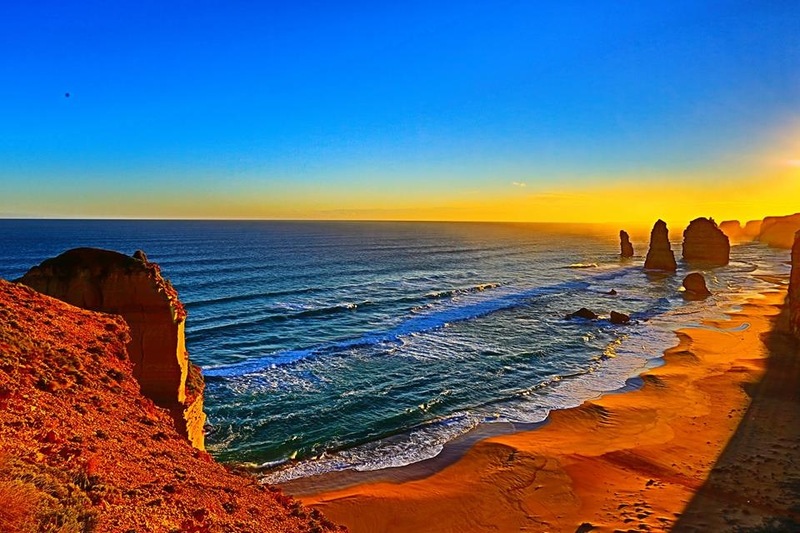 For that unforgettable experience, a helicopter flight over the Twelve Apostles will leave a lifelong memory of your fantastic holiday at Southern Anchorage Retreat and the Great Ocean Road. A 15 minute tour including 12 Apostles and London Bridge costs about $150pp, while the longer flight includes an extra stretch towards the Bay of Islands and costs about $250pp. My recommendation is to book on the day as flights leave regularly- and that way you can ensure weather conditions that suit. There is just so much to do and vi﻿sit locally. So many people underestimate the number of local attractions available and just think the 12 Apostles needs to be visited- plan your trip with a few days to a week and you'll still not visit everything! Southern Anchorage is just 20 minutes from the amazing Twelve Apostles coastline. I'd recommend visiting it at different times of day- and especially at Dusk, as the sunsets can be breathtaking! While visiting the area it is recommended to stop off at Loch Ard Gorge, and relive one of Australia's most remarkable shipwreck stories, while exploring the amazing walk down from the cliff tops to the beach below. Also close by is the cliff face walk named Gibson's Steps. This walk down the edge of the cliff takes you to one of my favourite haunts, as the beac﻿h below is a photographer's dream on sunset (as you can see in the picture above in the fishing section). Along this coastline there are heaps of stop offs, such as the Blow Hole London Bridge, etc. 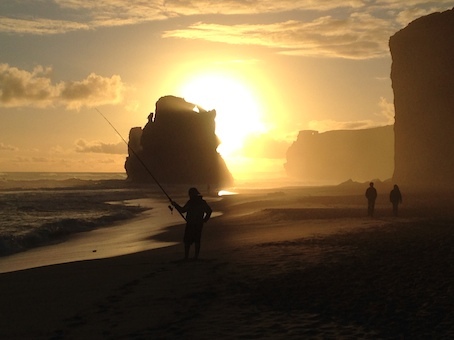 A great spot to visit is Port Campbell with it's great eating spots, histor﻿y and attractions. Further west and two terrific scenic and historic towns within day-drive distance from Southern An﻿c﻿ho﻿rage are Warrnambool and Po﻿rt Fairy. 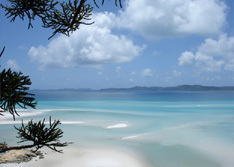 Within a few kms of us, mu﻿st visit places are ﻿Gable's Lookout﻿, Moonlight Head Lookout (end of our road) and Wreck Beach. Very scenic walks and spectacular photo opportunities make these places great stops. 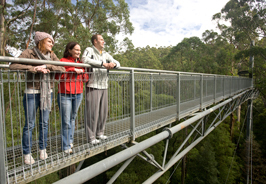 On the Melbourne side of Laver's Hill, is the must see attraction- the Otway Fly Treetop Walk. 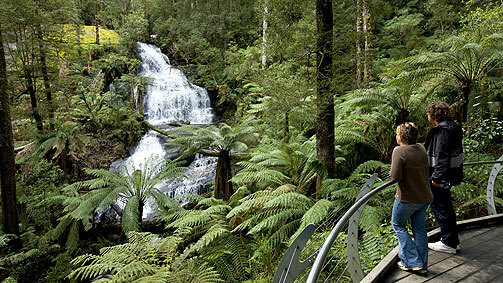 While in this area visit Triplet Falls- with its spectacular scenery and beauty, one of Victoria's best kept secrets! 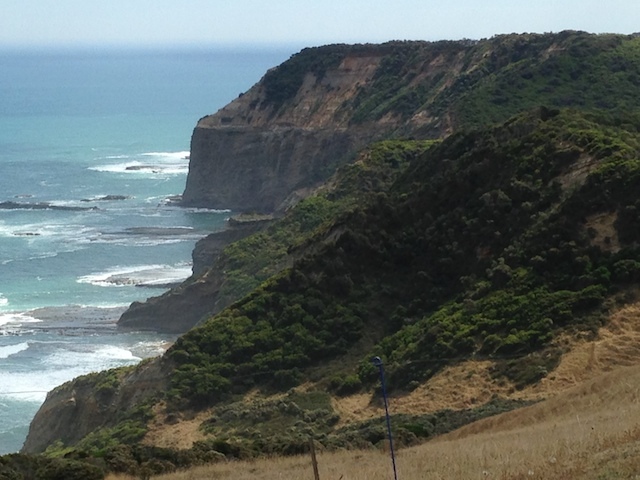 Within one hour of Southern Anc﻿horage a great day trip excursion is to the area of Apollo Bay and the amazing Great Ocean Road. 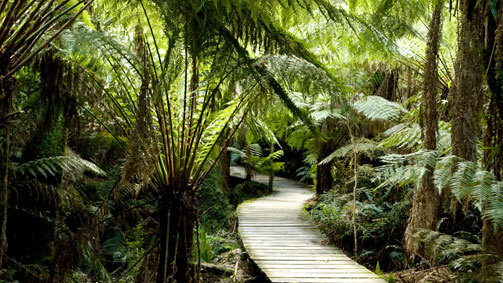 Don't forget to stop at the Cape Otway Lighthouse for its amazing history and scenery and Mait's Rest for it's rainforest walk. Whilst in the area there is a great opportunity to spy koalas in the natural environment and a visit to Bimbi Park or Crayfish Bay will mean you should spot a koala or two and marvel at this quiet and cute marsupial mammal. This is just a glimpse of the many attractions to our area and at Southern Anchorage we are the perfect base to explore many of the attractions nearby. There is so much to see and do- make sure you plan a week and we can recommend so many great and memorable day trips! - Gellibrand River Store. Terrific Food & Prices. Fully Licensed! Lavers Hill - 15 minutes from Southern Anchorage. - Lunch - I'd recommend Yatzies- on right in the middle of town. Great variety in menu and terrific vibe. Princetown ﻿- 12 minutes from Southern Anchorage. - Dinner - At the local pub you can enjoy a huge tasty meal! Try to eat the whole parma- good luck! My daughter's favourite is the Surf & Turf. Colac - 1 hour from us. - Dinner & Lunch- Gravity - Nice venue, good meal and reasonable prices. Colac East Pub - new owner, good dining and prices. Culture - More upmarket- nice meal and reasonable prices. Lorne & Apollo Bay - Lots of great dining & variety - depending on tastes! In the Bay I like either the Brewhouse, Great Ocean Road Hotel or Casalingos. Port Campbell - 30 minutes along Coast past Twelve Apostles. - Lots of great dining & variety - depending on tastes! See Below.